It is not easy being a potter in Santa Monica. There’s the high rent, competition from inexpensive ceramic imports and, of course, earthquakes. So how do you make it as a ceramic artist in Los Angeles? Diversify. 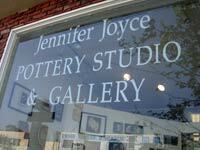 Santa Monica artist Jennifer Joyce has her clay caked hands involved many projects. She recently wrapped up a gallery show which featured her sculptural pieces of human figures, and huge lizard clad pots. And she frequently applies an innovative technique in which she transfers photography onto clay. She also teaches hand building and wheel throwing to adults in her boutique studio and gallery on Pico, and hosts clay and wine parties. Plus she instructs kids in local schools. But perhaps her most surprising ceramic projects are her large and small-scale commissions for home construction, remodeling and interior design. In a world where clay wrought trinkets are imported en masse and even beautiful modern ceramic home décor is sold at sweat shop rates, creating custom items for home remodeling is a natural fit for a Southern California potter. It allows her to push technical and artistic boundaries, create very large-scale pieces and, oh yea, pay the bills. And custom ceramics bring so much to a building project. Clay is a natural green material and, in this Home Depot world, a few custom decorative elements can provide a very personal touch that you can't get any other way. I’ve been taking weekly classes with Jennifer and have been amazed by the variety of projects she takes on. I thought she might want to share a little of this with the world so I interviewed her on her work, especially the construction and home improvement projects. MSG: What are some custom ceramic elements used in construction and interior design? JJ: Sinks and pedestal sinks, fountains, fireplaces, including mantels, door surrounds, floor tiles with custom design elements that mirror or complement other designs in the house. Kitchen counters and backsplashes, whimsical sculptures like floor to ceiling palm trees, any kind of custom tile work, like murals around a pool or address tiles. MSG: You produce some very large pieces. How does, say, a chimney or fireplace differ from a small piece that you produce in your studio? JJ: A large-scale ceramic piece involves engineering and more precise measurements than a small sculpture or bowl. The chimney I made was scaled up to size from a small drawing and that size was calculated for shrinkage. The size determined the kind of clay I used. Something that large has to have a lot of tensile strength to be able to withstand construction, firing and the weather outside. I normally don’t use clay with a lot of grog, but this clay has large and small pieces of grog so the shrinkage was minimal. It was important to keep the measurements as accurate as possible to fit the structure and stay in keeping with the design. MSG: The Gazebo project you just completed was huge! How big was the structure and how big were the pieces that you produced? JJ: The gazebo I just finished working on was 32 feet tall and about 30 feet wide. The chimney I made was seven feet tall in seven sections and the clay was on average ½ inch to 1 inch thick. The top piece, called the ganzara is 32 inches tall and 29 inches wide at the base. It was made in 5 sections with about 200 pounds of clay. The chimney was made with about 400 pounds of clay. MSG: That was a big project that involved, among other things, custom woodworking. Who did you work with on the project? JJ: The designer I worked with is Morrelli Bottega Maestri, which translates to “workshop of the masters.” Jeremy Morrelli is his name. MSG: How do you approach a commission? How do you gather the requirements? Do people come to you with complete ideas or do you provide the creative concepts? JJ: Regarding commissions, I try to get as much specific information from the client as possible. With architectural work I either use existing plans, as in the case of the gazebo, or create my own designs and drawings which I discuss with the client. When the client has signed off on a design, they are invited to see the project at various stages so I can make changes if needed. MSG: How would you describe your style? Is there a certain architectural style or artistic style you strive for, especially in your home remodeling work. You know like modern, Mediterranean, Spanish, Asian, architectural or arts & crafts? JJ: I wish I had a specific style but it seems to change depending on the kind of work I’m doing. 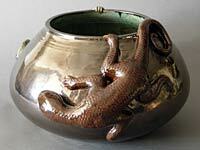 I am interested in the Arts and Crafts and Art Nouveau styles, figurative sculpture, Italian Majolica painting on ceramics and I’ve developed my own Majolica techniques. MSG: I know you also produce a lot of functional and decorative ceramics. Is there something in particular you are working on now? 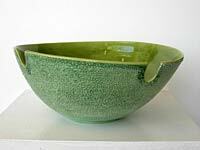 JJ: Currently I’m working on a series of bowls with rough textured surfaces and smooth shiny interiors. I have two fireplace commissions in the planning stages and an Art Deco countertop. And I just started an address number tile commission for a local real estate development company. MSG: What are some of the challenges of running a pottery studio in Santa Monica? JJ: Earthquakes and rent (laughing.) Seriously, doing too many things in too small a space. I am spread out throughout the city using a studio in Venice and another in downtown LA. Plus I teach classes in my Santa Monica studio, at Crossroads summer school and the Virginia Avenue Park teen center. MSG: Wow you are busy. Thanks for taking the time to share! See ya at class!